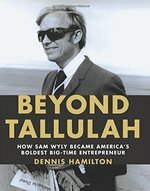 Beyond Tallulah, the illustrated biography of Sam Wyly, the most versatile big-company entrepreneur in American history, tells one of the most compelling untold business stories of our time. Wyly has built 10 companies in nine different industries with 500 million- or billion-dollar valuations. He’s the reason that Bonanza Steakhouse, Michaels Arts & Crafts and Green Mountain Energy are household names today. And his achievements serve as a valuable point of reference for today’s generation of recession-fighting Start-up Whiz Kids. With exclusive access to Wyly and original interviews of more than one hundred of his colleagues and family members, biographer Dennis Hamilton draws an energetic and fast-paced portrait of a business career that soared high, courted disaster and carved a memorable path through five decades. In the end, this story of an American titan of industry is made distinctiveand memorablethrough the details readers learn about Wyly’s deft, sure-handed approach to deal making and a seeming sixth sense for the ebbs and flows of the financial market. In Beyond Tallulah, we watch Wyly journey from small-town high school football in the South to IBM in its Information Age heyday, from the takeover wars of the 1980s to adventures in big-scale national retailing, from the Alaska pipeline to a new generation of clean energy. Wyly’s life promises to fascinate and inspire readers, while also serving as a blueprint for aspiring entrepreneurs. Illustrated with more than two hundred color and black-and-white photos, Beyond Tallulah preserves Wyly’s wholly original American journeyfrom his dirt poor Great Depression childhood in rural Louisiana to his triumph as a self-made billionaire . . . six times. Born in 1934, Sam Wyly was raised in rural Louisiana. In 1957, he received his MBA from the University of Michigan's Business School and began his career as a salesman for IBM and then for Honeywell. Six years later, at the age of 28, Wyly was out on his own, creating his first company, University Computing, which offered computer services to local businesses. Over the course of the next 50 years, he founded or grew successful companies in computing, computer software products, oil refining, insurance, steakhouse franchising, arts-and-crafts retailing, hedge fund investing, environmentally friendly electricity, and carbon offsets. In addition to being an entrepreneur, Wyly invests his time in educational institutions and has served as a trustee of Southern Methodist University, as vice chairman of the Princeton Parents Association, and on the board of PBS. One of Wyly’s proudest endeavors was providing the start-up capital for the Dallas PBS station to create a high-quality news program in 1968. The show was called Newsroom, which evolved into what’s known today as NewsHour with Jim Lehrer, one of the most trusted news sources for millions nationwide. Over his storied career, Wyly has received many accolades and awards. Forbes named him one of its 10 greenest billionaires in 2010. In 2003, Wyly received the Murphy Award for Lifetime Achievement in Entrepreneurship from the University of North Texas Murphy Enterprise Center; in 1997, the Woodrow Wilson Award for Corporate Citizenship and the David D. Alger Award from the University of Michigan Business School; and in 1970, the Horatio Alger Award and Entrepreneur of the Year honor from Southern Methodist University. In 1968, he was named One of Ten Outstanding Young Men in America” by U.S. Jaycees and in 1967, One of Five Outstanding Young Texans” by Texas Jaycees. In 2002, Wyly was interviewed by David Allison from The Smithsonian Museum as part of an oral history project about the origins of the computing industry. Today, Wyly is an active philanthropist, an avid reader and a family man. He resides with his wife, Cheryl, in Dallas and in Aspen, Colorado. They own an independent bookstore, Explore Booksellers. Wyly has six children, eleven grandchildren, and two great grandchildren. He is the author of a memoir, 1,000 Dollars & an Idea. How do entrepreneurs survive? How do they thrive? 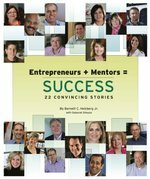 This book - by Kansas City entrepreneur Barnett C. Helzberg Jr. - will show why mentoring is the way. Here are 22 actual case studies of resilient people who grew their companies in part through the help of nurturing mentors participating in Helzberg's Entrepreneurial Mentoring Program. A kitchen soap maker who is now a large factory owner, a mismatched button customer who becomes an eco-friendly dry cleaner. How one's labors of law turn to labors of love at a culinary institute. You will learn not by rules or truisms but by the missteps and triumphs of these 22 lifelong learners. Through careful mentor matching and good luck, the right people nourished each other and the organization. Are you prepared for the turbulent years ahead? The world of work will change substantially...soon. Trends in the workforce, workplace, and workstyles will dramatically alter your life. 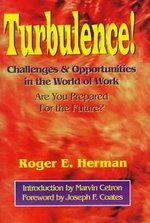 "Turbulence!" will help the reader prepare for an exciting future. Powerful information that can be put to work right away...this practical book is filled with insights, answers and strategies.